"Good afternoon ladies and gentlemen. Before I begin, I would like to say that the vision I have for the future and mankind would be considered by many, if not most, to be bold. Here, however, I am among like-minded people more so than anywhere else in the world. That is why it is great pleasure to share my vision with you today. I’m not a scientist and I’m not a philosopher. For the last 12 years, my work has been in media projects, particularly internet media. When I became interested in the idea of extending human life span and became a supporter of the idea of attaining immortality via the use of cybernetic technologies, I immediately understood how I could apply my experience. However, I've created a social movement and am working hard to promote this project not just because I have some understanding of how to do it. I'm also doing these things because they are necessary to make cybernetic immortality a reality. There are already many functioning innovations in the world today, so we are not far from making this project a reality. And now more than ever, the idea has to be promoted publicly, so that its supporters will declare commitment to it and create a social mandate. Scientists who are ready to devote time to the project need for this to happen; philosophers who are ready to provide a rationale for the project need this to happen; everyone who is ready to get involved but is holding back needs this to happen. It is scientists in particular who have proposed dozens of projects relevant to the movement who have formed the backbone of Russia 2045. They have been joined by philosophers, public figures, and visionaries . Now my task is to make the project international. That is why I am here, telling you about the social movement Russia 2045. I have a clear picture in my head, and I believe that that is how things will be and must be. I have limited time to speak, so I have to keep things short. But I would like to attest to the fact that the technical projects discussed in the presentation were created by professionals and represent our real plan of action. Some of the technologies presented already exist; others we plan to create within five to ten years; and still others modern science does not yet know how to create. 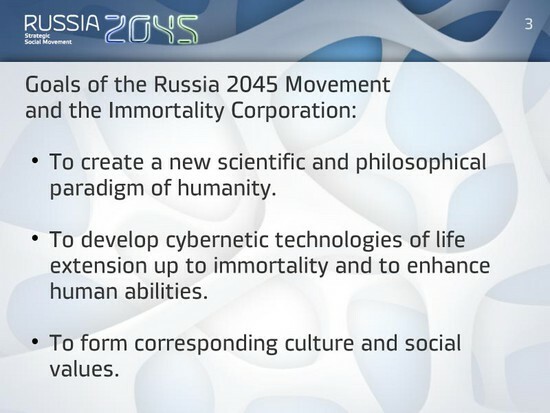 The social movement Russia 2045 was conceived of as a means of promoting the idea of humanity attaining cybernetic immortality. As the founders of the movement, we believe that these technologies in particular will provide the impulse that is so necessary right now to accelerate technological progress. It is cybernetic immortality in particular that will be able to grant people real freedom, including freedom from influence by the environment and the opportunity to explore the far reaches of space. Moreover, it’s possible that this scenario will become a reality sooner than other such possibilities for extending life span all the way to immortality. But in order to make our project a reality, there need to be changes in the ethics, culture, and thinking of those who will sustain the steady development of civilization during and after the evolutionary transformation envisioned by the project. On this slide, you can see the goals of our movement. We believe that humankind is currently on the verge of a complete collapse of its value structures. Consumer society is mostly concerned only with maintaining a comfortable existence and satisfying its desires. Science focuses on meeting people’s consumptive needs, and inventions that do not make an enormous profit are rejected—deemed nonviable, unnecessary. Our civilization, using modern means of transportation and communication, is incapable of liberating people from the constraints of a physical body, of eliminating disease and death. Consumer society provides corporations the opportunity to earn lots of money, but it never helps achieve a technological breakthrough. We are running in place ( we are spinning our wheels ) , even though we have the creative and intellectual capabilities to make many great discoveries. We believe that the world needs a different ideological paradigm. We must formulate an overarching goal that will provide a new trajectory for development and that will facilitate a scientific and technological revolution. For many days in a row now, people have been demonstrating in New York with cries of “Down with capitalism”. These cries give credence to the fact that the current capitalist model is undergoing a serious crisis. And there is every reason to believe that it will only intensify. We believe that the world needs a new social formation that can be based around the ideas of transhumanism. 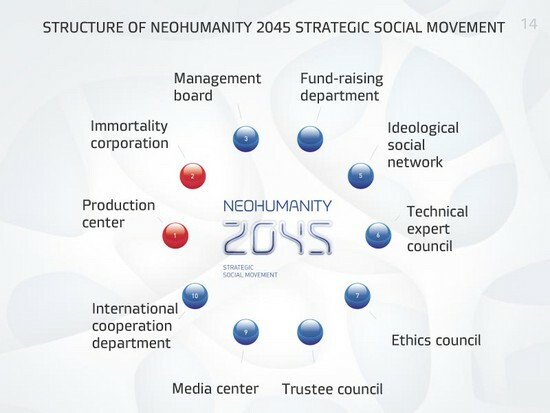 I believe, that 2045 Movement should use the term “neo-humanity” to refer to this social formation. There’s a well-known aphorism: “Political action happens on the streets”. In order for us to take political action, we don’t have to take to the streets. We have to become the intellectual elite of the future—to want to develop technologies and to begin doing so; to build a model of the new world. The community that will be built within the framework of the 2045 project will bring people together, steeping them in the idea. Over time, a new generation of like-minded people will emerge, and out of that generation will grow a new political and scientific elite. We need a revolution, but we don’t need a bloody revolution as there already was in the history of my country. We need a technological revolution, not street riots. The next slide has information on what we’ve managed to accomplish in seven months of work. Of course, the concept of immortality still inspires doubt in many scientists, though we have already moved past the stage of distrust and demonstrated the seriousness of our intentions. We have managed to move the discussion from the platitude “Is it possible or not?” to the platitude “Why does it need to be done?” We have come in earnest and are here to stay. With or without governmental support, we will open a specialized center in Russia, and it will focus on developing the technologies needed to achieve the cybernetic immortality of a person. For the first time ever, anywhere in the world. We are confident that such a project can be carried out without government support, by bringing people together who are interested in the project through the Internet. But the government that supports the idea and invests in the project will in the future become the economic and political leader of the world. That is not my view alone— for example, British scientist Kevin Warwick stated the same hypothesis in an interview. This slide shows what our main areas of technical activity are. 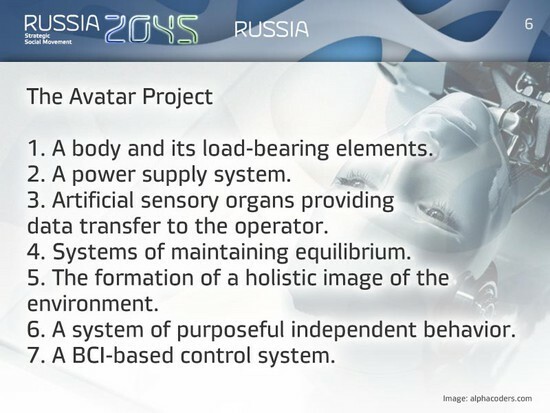 The aim of the first project, known as “Avatar”, is the creation of a robot copy of a human being controllable through a “brain-computer” interface. When I’m asked to give the gist of this project, I tell people to recall the film “Surrogates”, which depicts a world in which every person has an artificial body that he controls remotely. The makers of that blockbuster put an accent on the negative side of such a scenario. Nonetheless, the film’s highly graphic demonstration of the idea allows one to get an immediate sense of what it is. The Body B project - creation of a life-support system for the brain, a system that will link the brain to the outside world, and a method for transplanting the brain into an Avatar equipped to hold it. 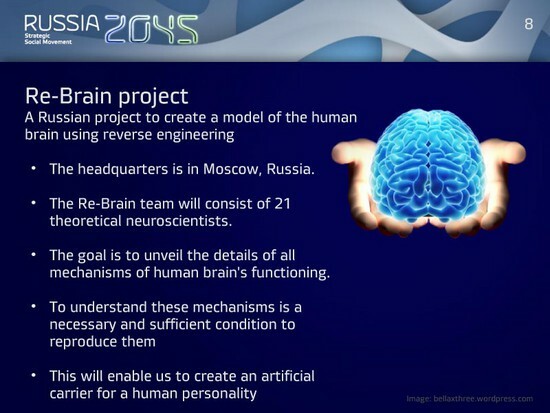 Project RE-BRAIN is, in essence, a Russian project to reverse-engineer the brain. In the long term, we plan to create an artificial brain and transfer personality into it. In addition, we believe, that unorthodox idea related to the transferring of consciousness to an alternative substrate can be developed. There are different takes on how artificial bodies will advance further. There are a lot of different ideas out there. Raymond Kurzweil hypothesized that the human body will be able to take any form composable by nano-robots. But in our plan, the end goal, is an artificial body similar to a hologram. What you see on the screen is specific projects to be carried out within the framework of the Avatar project. By specialists’ estimates, the first avatar could be built within the next five to seven years—after all, many of the technologies have already been invented. Of course, in the early stages it will be a lot simpler than in the film. But even that is enough to turn the world upside down. Avatars will be able to be put to use by the Ministry of Emergency Situations, firefighters, police; avatars will replace the fragile human body in outer space. 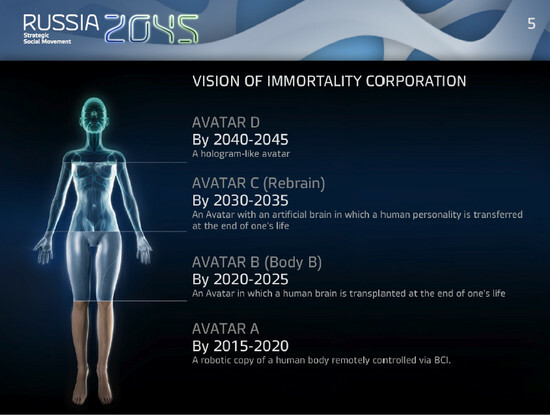 The avatar will even be able to serve as a business representative, traveling on business trips, signing contracts, etc. And its component parts will, without a doubt, be used in helping the disabled. Yes, there are some problem areas in certain technologies—for instance, autonomous energy supply and the operating speed of brain-computer interfaces. Nonetheless, in five to seven years’ time, our project will have made so much progress that it will have a pivotal effect on how cybernetic technologies are perceived in society. It will significantly change the world and will become as popular as the automobile. We are aware that such technologies have undergone significant progress in the U.S. (thanks in part to the efforts of our compatriots who left Russia in the 1990s and 2000s) and that considerable advancements have been made in certain European countries. And we believe that joining forces will only help things. Why waste time inventing the wheel when the bicycle already exists? The main objective of the Body B project, as I said before, is to design and build a system of life support for the human brain and a system that will allow the brain to communicate with the external environment. This is the idea that our movement is criticized most for. 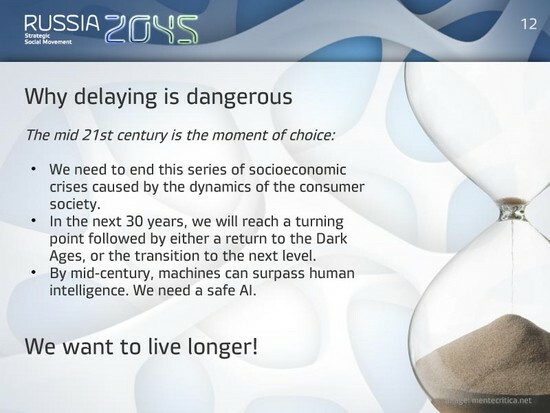 But I am confident that there will be many people out there on the verge of death who will decide to extend their lives, buying some time with the help of this technology before we are able to accomplish the third part of our project. There is already the Geminoid-DK android, which has a face that is indistinguishable from a person’s from only a few feet away. Technology is progressing, so why not prolong people’s lives in a body that, externally, is no different an is functionally almost the same. Russia has its own traditions in this area of research. Sergei Bryukhonenko is famous around the world for having been the first in the world to create a heart-lung machine. And Vladimir Demikhov, the father of transplantology, performed several successful experiments in which he transplanted dog heads, resulting in a two-headed dog. This is our project to reverse-engineer the brain. In September, the ReBrain project was presented at the Neuroinformatics 2011 conference in Boston by Witaly Dunin-Barkovsky. Once we have an understanding of how the human brain is organized and what human consciousness is, we will be able to transfer consciousness to a new, more advanced body. Some hold the opinion that the intelligence of modern man is an artificial intelligence. The only remaining natural thing about it is its protein-based host—the brain. Taking that a step further, the human brain is simply an instrument for connecting consciousness with the body. And when we are able to create an artificial intelligence, an artificial brain, and transfer our personality into an artificial body, then we will have a unique creature: a superperson with superpowers. Our upcoming plans include organizing an international conference called “Global Future 2045” that will be devoted to issues of modeling and predicting global dynamics, future scenarios for humankind, and universal history. It’s no accident we have so many plans related to social networks and online resources. These measures will help to take discussion of the project global. And the more participants there are in the social movement—the more like-minded people the project gets involved—the faster we will be able to achieve results. Our movement, just like any other complex and unusual project, provokes a great number of objections. 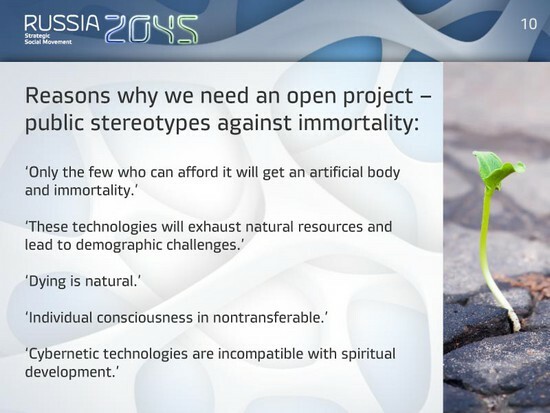 For the most part, these are negative stereotypes held by society about immortality and cybernetic technologies. I am prepared to respond to each one of them. Our project is for all people. It is for that reason that we insist that all our technical plans remain open, and in consequence that the technologies themselves remain open. We will openly publish the results of our research—that is the project’s guiding principle. Artificial bodies will be available to all who want them. It is each individual’s choice whether to use new technology or to leave one’s life the way it is. These technologies will not lead to social stratification, but on the contrary, will decrease tensions—people will cease judging others by the color of their skin, by their belonging to one race or another. The technologies used to manufacture artificial bodies and to transfer human personality into them will not be based on oil and gas—they will be of a different nature. And if, with the help of cybernetic technologies, humankind is finally able to live in outer space, all demographic problems will be solved. Yes, our opponents say that “death is a natural process”. However, statistics are stubborn, and studies show that only two percent of people are ready to accept death. A friend of mine once said on Facebook that everyone wants a new phone, a new car, a new laptop. But when a person has cancer, all he wants is to survive. So—do not believe those who say that it is impossible to create an artificial brain or to transfer consciousness to an artificial body. The very statement “will never happen” contradicts the principles of science. Indeed, the technical means do not yet exist to accomplish the ultimate goals of the project—but new technologies are being invented all the time, and the possibilities are expanding. At one time, atomic energy seemed like science fiction and space travel farfetched. But not a single self-respecting scientist can say with confidence that there is no chance of an idea emerging in the next five to ten years that will make the impossible possible. It’s a question of time. And it’s a matter of making the effort and bringing people together. Our project can become a national idea for every country and a global idea—it can unite people and governments. This project must be made possible. Every technological breakthrough absolutely must be accompanied by an elevation of people’s values and an increase in awareness—otherwise, civilization will meet its downfall. This is a law of the development of civilizations. We, humans, will need to evolve intellectually and spiritually together with this project. In gaining our new capabilities, people will cease to be so dependent on their bodies and many things will open up spiritually. People often respond to our message by saying, “We want to remain immortal in works of art, in people’s memories”. But immortality in iPhones, books, and in portraits of their inventors and creators is nothing more than an elegant metaphor. People live only to the point that they can no longer communicate, have control of something, have the ability to defend themselves in a court of law, develop physically, intellectually, spiritually. We understand that even life of the universe is finite. So we want to reproduce our definition of immortality, some criteria, orienting points. And we will consider our goal achieved when technologies exist that allow us to extend human life span from 5,000 to 1,000,000 years. However, the choice remains in the hands of each individual. Here is an example of technology that is impossible to create at the present time. Two American agencies—the defense agency DARPA and the science agency NASA—are developing the first interstellar space ship in the history of humankind. 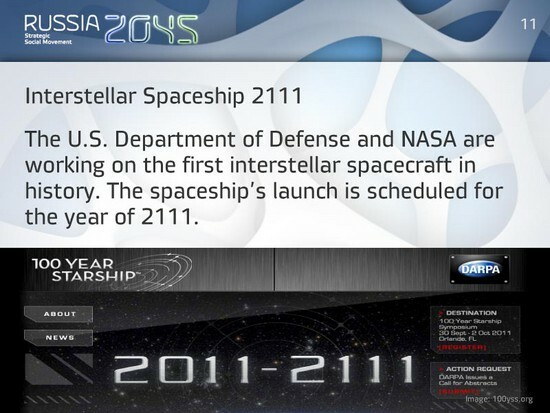 The spacecraft is set to be launched in 2111. According to the director of DARPA’s department of tactical technologies, David Neyland, work on that project will require scientists to “go out and tackle problems that will have you asking questions you didn't even know to ask at the beginning”. Two powerful trends are currently converging: the evolution of the technological environment and the cyborgization of people. It’s clear that as technologies advance and the technology of brain-computer interfaces improves, people will be able to control machines with their thoughts. With the development of artificial organs and other systems, it will become possible to connect—or, I should say, to “embed”—additional terabytes of memory in a person, such that a person will be able to control a fantastic amount of resources, instantly sending and receiving information. And the main problem that will be faced by this superbeing that humans could very soon become will be that its life span is too short. We don’t want to die. And anyone who answers “No” to the question “Do you want to be immortal” always says “Yes” to the same question with regard to their relatives. It’s clear that the refusal to accept the idea of cybernetic immortality is the result of a fear of their ego and the shock of the future. People are afraid because they cannot imagine what the future will look like. Our job is to show people what it will look like. People are held back, by fear of change, inertia, refusal to accept the new. Those are the things keeping people from admitting their desire to live forever. 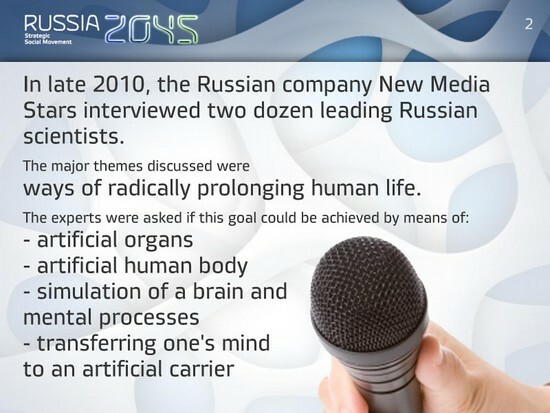 We are planning to transform Russia 2045 into a global movement, with the name “Neohumanity 2045”. 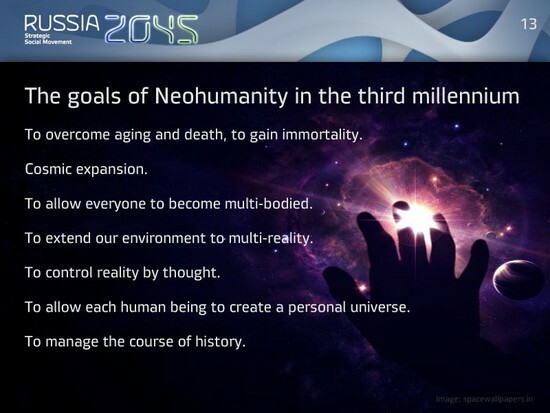 In this slide I would like to show you my vision of the objectives for Neohumanity for the next thousand years. While you look them over, I will say a few words. There is a long history of tense relations between our countries, Russia and the U.S. There is a history of competition in space technology, the history of the cold war and the arms race. I would like to propose we start a new race—a race to attain immortality. It will be the first positive project, one that does not make relations worse but improves them. We will come together for the first time in order to do something so useful and good. Common sense must trump egotism. Instead of inventing new threats to people’s health and lives, we for the first time will think about how to preserve life. For the first time, our competition will be for a good cause. And it’s not important who wins. What’s important is that people get to live as long as they want. All humanity will benefit from this. And now, back from the future to the present. On the screen you can see the planned structure of the project for the next 10 years. I would like to sum up the presentation and to recall the words of a famous scientist and a man I respect, Stephen Hawking, to whom I would to give one of the first avatars I create: “All the possible separate universes exist simultaneously in a state of quantum superposition. When you decide to take a measurement, you choose a subset of histories from the range of possibilities, and those histories share specific measurable parameters. The history of the universe that you perceive is chosen from that subset of histories. In other words, you choose the past.” I would go further and add, that in this you choose the future also. Call me a romantic, but if we all decide that we want to live in a world in which people are immortal and truly free, then we will end up in such a world. We need to gather a critical mass of people who think in the same way. When we all decide that that’s what we want, our ideas will begin to be realized. So, let’s get together and live in a reality in which we will live forever. It’s our right. If someone does not like the new free world, let them stay in whichever world they want. But they shall not challenge our right to be free and immortal. This is my dream and I’m ready to devote my life to it. Right now, in this place there are probably more like-minded people present than ever before. There are also like-minded journalists here. I suggest that we take advantage of this opportunity and declare our intentions to change the word. And I ask to consider my speech an open invitation to all world leaders and the head of the United Nations Ban Ki-moon to consider our ideas and to recognize its social significance".